Please read through directions before starting! 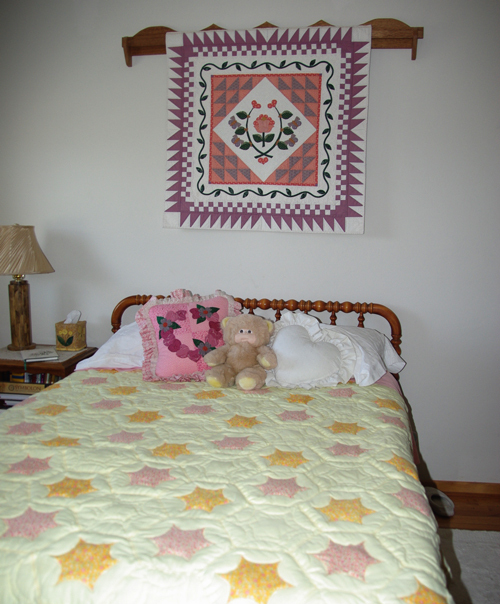 The Hexagon Baby Quilt is approximately 40″x42″ across the narrowest and widest points. 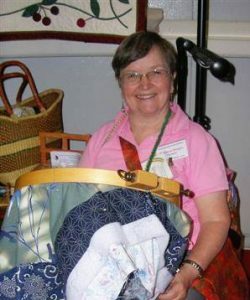 The above photo shows a full-size quilt and the layout for that is below. The directions are for a baby quilt to simplify the assembly. To make it larger cut more hexagons and follow the same basic instructions! The fabric amounts are hard to pinpoint because the shape doesn’t fit exactly into a rectangle, but I have listed the minimum amount that is needed. I used muslin sheets 45 years ago when I made this quilt, so the choices were a lot different then. 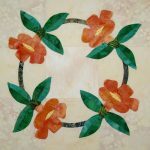 1-1/2 yards of 42″ wide fabric are needed for 20 hexagons, only 19 are needed for the baby quilt. 10 yards each of front, back and batting. This amount allows for seam allowances and areas that are cut away because of the shape. 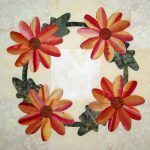 3-1/2 yards for the appliqué. No seam allowances are needed. Arrange the shapes as close together as possible. Plastic template material or cardboard for the templates. Scissors for cutting paper and plastic to make the templates. .05 pencil with medium (B) lead for marking shapes or a washable pen. Quilting thread for hand quilting. Machine sewing thread for machine piecing, quilting and/or appliqué. Cut 19 hexagons from the front fabric, back fabric, and batting. To save as much fabric as possible. Draw around the template, then trace another one so the lines are shared. Layer front and back fabrics, right sides together and a batting hexagon on the bottom, matching edges and corners. 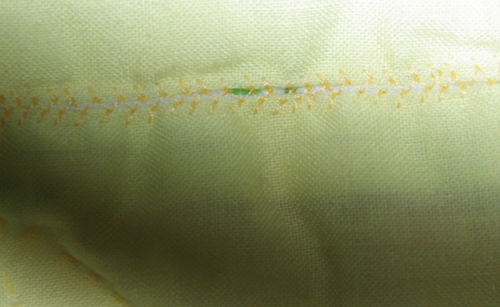 Sew a 1/4″ seam, through all three layers, along five edges. Start and stop with a back-stitch. Turn right side out, through the open side. Tuck in raw edges 1/4″ to make a smooth edge and baste shut. 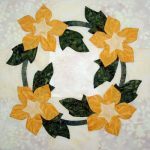 Hand or machine quilt the six-pointed star in the center of nine hexagons. 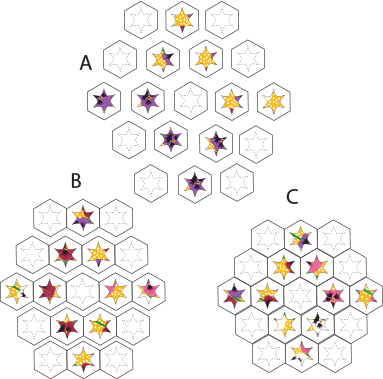 Cut the same design for the appliqués and machine appliqué them on the remaining ten hexagons. 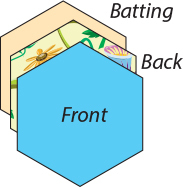 Arrange hexagons as shown in the diagram. 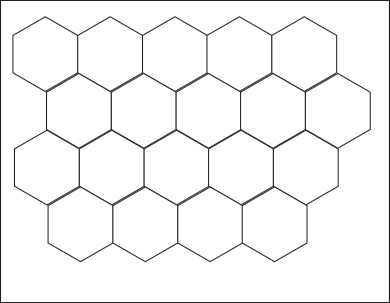 Join hexagons into rows by machine. 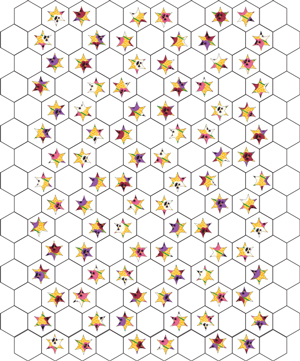 Lay the hexagons side by side, do not overlap. Use a decorative wide zigzag. Make sure all the open edges are joined to another hexagon so no open edges end up on the outside edge. Otherwise, you will have to close those edges by hand. Join rows together with the same method. Remove basting stitches and your quilt finished. No binding required. Here is the diagram of the full size, approximately 93″x112″ quilt.